September 1942. 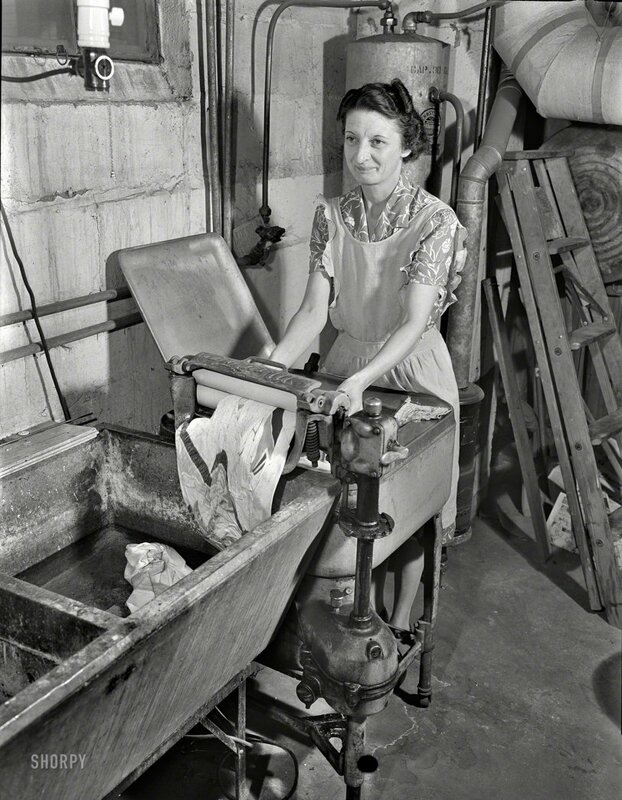 "Rochester, N.Y. Mrs. Babcock doing the family laundry with an electric washing machine and a wringer." All the modern conveniences -- the wringer is motorized. Photo by Ralph Amdursky for the OWI. View full size. Submitted by EvenSteven on Sat, 02/09/2013 - 5:53pm. Mrs. Babcock in dress and apron brings back memories of my Mom. The ladies of that time would put in a full day's work in that outfit but just before hubby was due home off came the apron, a dab of perfume was put on, a fast brush through the hair and of course fresh lipstick made her ready to give her man a welcome home kiss at 4:45 pm. At least that was the way it was at my house. It seems to be on the hot water line (going by cold-right/hot-left on top of tank). 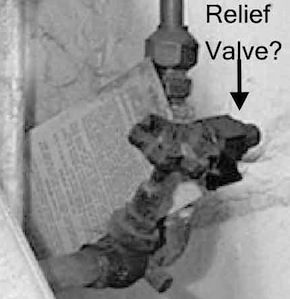 That card might be instructions about the purpose of the valve. At least I hope it is for if that old seamless tank went it would go trough the roof and land a block away. Submitted by Faust on Sat, 02/02/2013 - 12:06pm. We had a tank just like that in our bathroom right up until 1968 when we put in a new furance and a water heater. Mom or Dad had to light it in the morning to get any semblance of hot water, most of the time we washed our faces with cold water before school. The thermostat was old-school; you felt on the outside of the tank to see how far up the hot water was, and how hot it was! You could get burned brushing against it and with it right inside the bathroom door you really had to watch. A few times the tank was forgotten and split the seams. Ah, the good old days. Submitted by LadyCelia on Sat, 02/02/2013 - 8:31am. The identical washing machine/wringer are sitting in front of the local Cracker Barrel. Give its height, I'm guessing Mrs. Babcock was about 5 feet tall or a bit under. Submitted by Cedarspider on Sat, 02/02/2013 - 12:44am. This brings the memories back. Our neighbor across the street was out in his back yard looking at the water heater laying in the grass. Earlier it had launched itself from the basement through his boys bedroom and out through the roof, where it landed in the yard. As a kid I was told they were dangerous and after that incident I believed it. There wasn't a pressure relief and the tank looked as if the the seams were riveted. Submitted by 3dfoto on Fri, 02/01/2013 - 10:25am. The drain in my circa 1953 tub rusted out and I replaced it with a plastic sink. Getting the old tub out involved a sledge hammer and elbow grease. I hauled the pieces out by the bucketload. There's one more piece to go. Submitted by CGW on Fri, 02/01/2013 - 7:32am. Submitted by Angus J on Thu, 01/31/2013 - 6:57pm. These concrete laundry tubs were installed in the basement of my house when it was built in the Dunbar neighbourhood of Vancouver in 1928. Only recently did I have to replace the original galvanised drain pipe. Things were built to last in those days! The wringer washer is a 1944 Beatty from the apartment building I once lived in, and it still sees occasional use. I usually use the 1967 Speed Queen washer to the right, and the dryer is a 1958 speed Queen. Submitted by Born40YearsTooLate on Thu, 01/31/2013 - 12:29pm. At the time the 1940 U.S. Census was taken, Howard A. Babcock (age 40) and his wife Mary E. Babcock (age 38) lived at 239 Selye Terrace in Rochester, with their children, daughter Shirley L. (18), son Howard A. Jr. (10), and son Earl E. (4). They rented a room for $35 a month (the two story apartment building still stands at the corner of Selye Terrace and Dewey Avenue, according to Google Maps). They also had a lodger, a widower named Alex N. Alexander, age 47, an auto parts inspector who was born in the Irish Free State. The Babcocks were all born in the US. Mr. Babcock was a machinist in the gun industry, while Mrs. Babcock was a homemaker. Shirley was working part time in sales for a department store (she had worked six hours in the prior week). If they were living in an apartment building, could the basement laundry have been a communal one shared with the other renters? Submitted by Paul A on Thu, 01/31/2013 - 10:41am. I have the same concrete laundry tub in my 1939 built basement and it's staying. One of the basins has a zinc washboard built in to the sloped front. Submitted by LestWeForget on Thu, 01/31/2013 - 7:36am. These wringers were tough on buttons. I recall that it was standard procedure for my Mother to get out the sewing kit after the washing was dried as there always seemed to be at least one broken button to replace. Ah the old concrete wash tub. Submitted by csteinmayer on Thu, 01/31/2013 - 6:52am. My house in Oak Park Mi built in 1954 had one. Used a sledge hammer to remove it. It was concrete with a zinc liner on the top edge, resting on a steel frame. Looked exactly like the one in the picture. I wonder if the photographer removed the light bulb from the socket above? Submitted by archfan on Thu, 01/31/2013 - 12:13am. 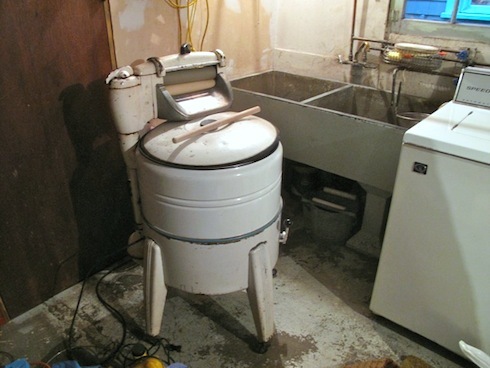 We had a similar washer (and sinks) in our basement in the 60's, and I heard the horror stories, too. Of course I had to play with it. I sneaked down to the basement and turned on the wringer, and managed to get my hand between the wringers. My arm was in past my elbow before I managed to turn a switch to release the tension on the rollers, which let me pull my arm free. I turned it off, made sure my arm still worked, sneaked upstairs, and never touched the dang thing again. Submitted by BdgBill on Wed, 01/30/2013 - 10:10pm. I grew up hearing horror stories of the women and sometimes children who were maimed by motorized wringers back in the days before safety devices and tort lawsuits. Submitted by urcunina on Wed, 01/30/2013 - 6:47pm. I vote the sink is soapstone. I grew up in a 1920's house with one. They can get really grungy looking but can be renewed with cleaning and sanding. An application of mineral oil will make it shine. Our washing machine was similar to this one and also plugged into the light socket. Ten years ago, I had a soapstone kitchen counter installed in my house. It's indestructible and totally heat resistant. It will scratch, but sandpaper and oil renews it. This sink could weigh 400 pounds or so. Submitted by Solo on Wed, 01/30/2013 - 4:41pm. Displayed vertically, behind the step ladder, is half of the system that predated the washing machine and utility sink: a galvanized laundry tub. Presumably its complement, a washboard, is still in the basement somewhere. Submitted by Andersdel on Wed, 01/30/2013 - 3:57pm. is in my basement. The house dates to 1884 and I'm sure it has never had another since some long gone owner put a machine in. As mentioned, it's heavy, impervious to wear--you would really have to hate it to go to the trouble of replacing it. If that house in Rochester still stands, I'd bet money that thing is still there and still in service. Submitted by su dee on Wed, 01/30/2013 - 3:51pm. Why is she putting clean, squeezed clothes in that filthy sink? Submitted by nukjam on Thu, 01/31/2013 - 11:41am. Looks like an asbestos-wrapped cold air return from an old gravity furnace behind her. Coal fired I'm assuming? 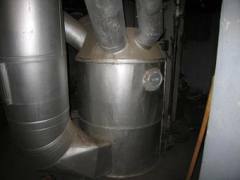 Those old furnaces needed wider diameter ducts than their modern day forced air counterparts. I'm guessing its a cold air duct as its situated on an exterior wall; modern day systems use the opposite configuration where cold air returns are on interior walls. What's in front of the window? Submitted by WoodsideParkBob on Wed, 01/30/2013 - 3:29pm. What is the piece of equipment in front of the window? The top part with the knob looks like it is made out of white PVC plastic, but that doesn't seem likely in 1943. Submitted by UpNorthBob on Wed, 01/30/2013 - 3:24pm. It appears that Mrs. Babcock's washing machine is plugged into the overhead light socket adapter. Hope it didn't cause problems. I agree with the person who noticed she looks happier than she does in the family pictures. Submitted by OldeRadio on Wed, 01/30/2013 - 3:03pm. My mother's laundry had an identical tub in the 1950's. It has a zinc molding over the top edge, but the inside surface of the tub is concrete. They are hard to keep clean, but nearly indestructible. Mrs. Babcock's washer looks like my grandmother's Maytag. The uninsulated hot water heater in the background must've kept this corner of the basement nice and warm. Submitted by RJP on Wed, 01/30/2013 - 2:12pm. I haven't seen one of those things in years. My childhood home (built 1949) had one. The next house had enameled steel. Now all you see is plastic. Every change I'm sure makes them easier to install! Submitted by tterrace on Wed, 01/30/2013 - 2:05pm. Mrs. Babcock appears to be happier while doing the laundry than she is sitting with her family.